Bake your shortbread in the top third of your oven. This way you won’t get too much bottom heat that will cause the bottom of the shortbread to overcook before the top is done. To make sure that your shortbread releases from the pan cleanly, be sure it is completely cooked in the middle before you remove the pan from the oven. Directions for shortbread baked on a cookie sheet often tell you to cook the shortbread only until the top of the cookies just barely begin to color. This is not the case with shortbread made in one of the Brown Bag Cookie Art Shortbread Pans. Since you will be cooking your shortbread in the top third of the oven, you will get some top browning as the cookie bakes. The surface of the shortbread should be a toasty light brown when it is cooked. It should never appear raw or slightly opaque in the middle. If it is under-baked in the middle, it will probably stick in the pan when you go to unmold it. Be sure to let the shortbread cool in the pan for 10 minutes before you flip the pan over to unmold it. This gives the delicate cookie a chance to firm up a bit. After cooling for 10 minutes, hold the pan parallel to and 1” above a wooden or plastic cutting board, face down, and unceremoniously drop it. This jars the shortbread, and it drops right out of the pan. Slice the shortbread into serving pieces using a thin, sharp knife, while it is still hot. If you wait until it cools, it will become flakey and too fragile to cut cleanly. Making the perfect cookie involves more than just having the perfect recipe. You need to know the secrets to having your cookies turn out perfect every time. While you don't have to follow a recipe exactly, neglecting some important details can make a finished product less than desired. In her book Cookies and Brownies (1999, Warner Book, A Time Warner Company, New York) Alice Medrich states that "inaccurate measurements do not always spoil the cookies." You can toss in extra raisins, nuts, chocolate chips, coconut, or even vanilla. You can substitute dried fruits for nuts or vice versa and experiment with extracts and flavors. But if your flour measurement is inaccurate, your cookies may be tough, dry, doughy, or leaden. Always measure the baking soda, baking powder, salt, and especially flour accurately. Before measuring the flour, stir it with a spoon if it is compacted. Then lightly spoon flour into your measuring cup until it is heaped above the rim. Do NOT shake or tap the cup to settle the flour, or you will have more flour than you need. Slide a spatula or knife across the top to level. When measuring liquid ingredients, use a clear plastic or glass container with lines up the sides. Set the container on the counter and pour the liquid up to the appropriate mark. Lower your head to read the measurement at eye level. When you mix the flour to the moist ingredients, stir just until blended. Be careful not to over mix or beat your cookie dough, unless you like tough cookies! One helpful hint is to mix the dry ingredients thoroughly first. You want the dry ingredients to be fluffed up rather than compacted so it blends easily with the dough. You can use a wire whisk to mix the dry ingredients. When baking cookies, choose light-colored, dull-finished, heavy-gauge cookie sheets. Old cookie sheets that are dark can make the bottom of the cookies overly brown. Shiny sheets work best for cookies that should not brown too much on the bottom. Do not use insulated sheets for cookies high in butter, shaped cookies, and some drop cookies. The butter may start to melt and leak out before the dough sets. If this happens, the cookies may have thin edges. Except for bar cookies, don't use cookie sheets with high sides which can deflect heat and also make it difficult for you to remove your cookies. Your sheets should be two inches narrower and shorter than the oven to allow for even baking. If you don't have enough cookie sheets, you can invert a jelly roll pan or use heavy duty foil. Put the foil on the cookie sheet as it comes out of the oven and bake immediately. For any dough that needs to be rolled out, refrigerate the dough for a couple hours (or overnight). Use a rolling pin and lightly flour your work surface. If you use too much flour, the dough will absorb it and become tough and dry. You can also roll the dough between sheets of wax paper (or a cut-apart plastic bag). Since the dough softens quickly, only work with part at a time. Keep the rest cooled until ready to use. The thinner the dough, the crispier the cookie. When making sliced cookies, finely chop any nuts or fruit that you add to the dough to make it easier to slice. Chill the dough and cut with a think sharp knife. Wipe the knife occasionally with a clean paper towel. Occasionally turn the roll of dough while you slice it to get nice round slices. For drop cookies, make your cookies about the same size so they bake evenly. A cookie scoop helps form equal-size lumps. Space all cookies evenly and leave enough space between each cookie to allow for spreading while baking. Preheat the oven which takes about fifteen to twenty minutes, depending on your oven. Use the upper and lower thirds of the oven, reversing sheets from upper to lower and front to back about halfway through the baking period to ensure even baking. If you use only one sheet, position the rack in the center, and change from back to front halfway through the baking cycle. To check cookies for doneness, press down lightly in the middle to see if it bounces back. Bake sliced cookies until the edges are firm and the bottoms are just lightly browned. Generally, cookies are done when the edges begin to brown, or when they are golden. Every pan bakes differently, depending on the material, thickness, weight, and surface reflection. To fine-tune the baking of cookies, test bake a couple cookies. If your cookies spread too much (and you didn't over grease the pan), then you may need to add a tablespoon or two of flour. If you're not certain of the time for baking, you can test bake four cookies, and remove two of them a minute or two earlier than the others. Let them cool before tasting them. Place cookies on wire racks to cool evenly, so the bottoms don't get soggy. You can transfer some cookies immediately to the wire racks, while others need a couple minutes to cool. If the cookie bends or breaks when transferring, wait another minute before trying. Thoroughly cool cookies before storing them to prevent them from become soggy. Store cookies in air-tight containers such as tins, cookie jars with tight-fitting lids or zipper-type bags. Clear plastic containers are the best since the plastic preserves freshness, and the clarity lets you see what's inside. For delicate or frosted cookies, use a wide container and put parchment paper between the layers. Separate the hard and soft cookies and cookies with different flavors. If you store them together, the soft cookies will cause the crisp ones to go limp, and the flavors often mix. Prepare cookie sheets and baking pans as directed before you begin to mix the recipe. If light greasing is suggested, use vegetable oil spray or a small amount of solid vegetable shortening. Do not use butter or margarine as it may burn on cookie sheets. You might want to use baker's parchment paper (available in many supermarkets and specialty stores) instead of greasing cookie sheets, it will also save on clean-up time. To prevent the jagged edges that often occur when cutting cooled cookie bars: 1. Use a sharp knife to score the bars as soon as the pan comes out of the oven. 2. Then cut the cooled bars along the scored lines. Allow cookies to cool slightly before removing them from the baking sheet. As soon as they are firm enough to move without breaking, transfer them to a wire rack to cool completely. Do not leave cookies on the hot baking sheet, they will continue to cook. Too many cookies on your hands? Want to have a large variety of cookies ready-made at your fingertips? Like to have cookie dough around for those last-minute needs? Move those frozen chicken pot pies and cartons of fudge swirl ice cream aside. It's cookie-freezing time! Most cookie doughs freeze extremely well and can be kept frozen for up to 4 or 6 weeks. The most important thing to keep in mind is that the dough will absorb any odd odors present in your freezer if it's not properly wrapped and sealed. To prevent this smell-sponge effect-as well as freezer burn-wrap the dough securely twice. It's also a very good idea to write the type of cookie dough and the date it was frozen on the outside of the package. When you are ready to bake simply let the dough defrost in the refrigerator. This will take several hours, so plan ahead. The cookie doughs that freeze best are shortbreads, chocolate chip, peanut butter, refrigerator, sugar, and brownies, just to name a few. The types of cookie doughs that do not freeze well are cake-like cookies and cookies that have a very liquidy batter, such as madeleines and tuiles. Freezing baked cookies is a great way to preserve their freshness. Baked cookies will keep in the freezer for up to 3 or 4 weeks. As with freezing cookie dough, the most important thing to keep in mind is that you don't want your cookies to absorb any odors. Double-wrap the cookies securely and write the date and the type of cookie on the outside of the package. When you are ready to eat your frozen cookies, just let them come to room temperature, or, for you impatient types, pop them in the microwave on high for about 30 seconds. (Times will differ depending on the size of cookie you're defrosting.) We still haven't come across a baked cookie that doesn't freeze well. So feel free to freeze loads of assorted cookies to keep yourself supplied with yummy goodies, any time. Decorating transforms the simplest cut-out cookies into sensational miniature sweets. Both children and adults can enjoy creating edible masterpieces and any occasion can provide the inspiration—you'll quickly discover that the design possibilities are endless! Perhaps the best thing about this craft is its simplicity. Our Bloomin' Sugar Cookies (see recipe and instructions below) are decorated with Royal Icing, a simple mixture of confectioners' sugar, water and egg white or meringue powder. Decorating with royal icing is a skill often used by professional bakers, but with a little practice and our easy instructions, you can achieve the same fanciful results. So turn your kitchen into an art studio with some simple equipment, straightforward techniques and lots of imagination. Allow plenty of time and space for a decorating session. Cover surfaces with waxed paper to keep counters clean and create plenty of space for cookies to dry before storing. When working with several colors at once, disposable pastry bags are handy. Or, make your own decorating cones with several layers of waxed or parchment paper. You can also turn small, zipper-top plastic bags into pastry bags by cutting a tiny snip off the corner. Stand bags in juice glasses for easy filling. Fill the bags no more than half full. To color the icing, divide small amounts of icing into custard cups. Reserve one cup as white icing. Add food coloring, a tiny bit at a time, to remaining icings. Mix with a spoon or toothpick until well blended, gradually adding more coloring until desired color is attained. Use a pastry bag filled with thick icing to pipe designs on top of cookies. If you're a beginner, use no more than two colors and practice making decorations on a sheet of waxed paper before getting started. Flexible metal spatulas, writing tips, plenty of custard cups, toothpicks, brushes, waxed paper and disposable pastry bags. 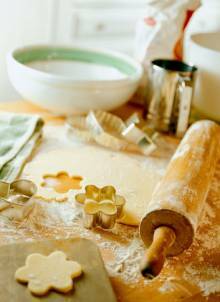 Let icing dry completely before storing cookies or piping one color onto another. To dry iced cookies faster, place in a 200F oven with the door ajar for 5 minutes. If you make more icing than you use, cover it with plastic wrap and refrigerate for a few days. Stir gently if mixture separates. Looking for a way to make someone’s day? Give them this delicious bouquet of colorful cookie flowers! 1. In a large bowl, using mixer set on high, beat butter and granulated sugar until light and fluffy; on medium speed, beat in egg. In a medium bowl, combine flour, baking powder and salt; add to butter mixture. Beat in melted white chocolate until thoroughly combined, about 1 minute. Form dough into a disk; wrap in plastic. Chill until slightly firm, about 15 minutes. 2. Spread wooden skewers in a large pan; cover with water. Add green food coloring to water in pan. While wearing gloves, gently toss skewers around the pan. Transfer skewers to wire rack; let dry completely. 4. Bake cookies until lightly golden, 6–8 minutes. Let cookies cool completely. 5. In a large bowl, using a mixer set on medium, beat confectioners’ sugar, water and meringue powder until fluffy, about 4 minutes. Divide icing among small bowls; tint icing with food colorings as desired. 6. Using a small paintbrush, spread tinted icing over base of cookies; let dry. 7. Fill separate pastry bags fitted with medium writing tips with remaining tinted icings. Working with 1 cookie at a time, pipe an outline onto cookies; pipe lines and dots in contrasting colors. Let cookies dry completely.